Its foundation is dated to around 3000 BC and it flourished until approximately 1500 BC(a). 2010 saw the first discovery in Dholivira of an inscription on natural stone in the Indus script. 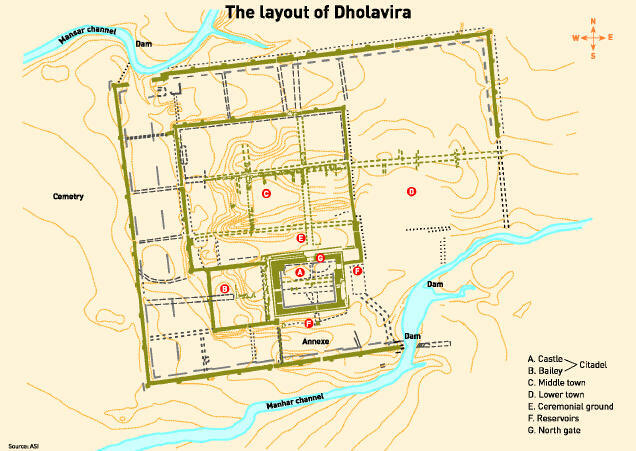 2011 produced a report(b) that what may be the world’s oldest theatrical stage had been found on the Dholavira site. In October 2014 it was reported that a stepwell, dated to 3000 BC, had been discovered at Dholivara that was three times the size of the ‘Great Bath’ at Mohenjo Daro(c). *Brychta wrote an article on his Atlantean Dholavira for the Atlantisforschung.de website(d)..